How many of you would love to dive into water without actually getting into the water for grabbing those water-beings? If you love ice fishing and want to arrest them, you actually need a detective that will help you get them through the ice. And that detective can be marcum lx9. But before you get the device into work you need to know about the device at very first.So how about we help you a bit with our marcum lx9 review. Since this finder has grabbed all the attention for its super camera and recording features, it deserves to be checked on to understand why you need one. So we hope this marcum lx9 review will answer all your questions and you get to have it just after you are done with the write. This is what this device has got to offer and got us write a marcum lx9 review. One of the most hype features of lx9 is its camera and record combo. So, owning a built-in digital video recorder, lx9 just won the whole underwater world with this technology. You cannot only stalk the fish but record their activity with the camera so that you can share your experience with others. Moreover, with the anglers, the finder can predict the outcome of the ventures and track the water-beings more efficiently via comparing sonar signals with the live footage that will provide a smart underwater analysis. So, the device does let the virtual reality join aquatic reality. Besides, the camera features a digital temperature sensor, an electronic compass sensor that you can use to determine the heading of the cam and a pressure sensor for measuring cam depth. Also, if you want, make sure that you check out our marcum lx 7 review. However, apart from the high-resolution color camera, this device has got an integrated switchable dual beam transducer. 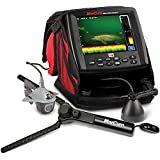 So you can fish with either wider or narrower beam that you think will best suit the conditions. Additionally, with the help of Sonar Footprint, lx9 will show the actual area that your transducer will cover while you are busy in fishing. However, when you will put on the device, it will start to transmit utilizing the 20 degree setting but you can switch it to 8 degree with hitting the cone angle. And this is how you can switch between the cone angles to do fishing. The lx9 features the ZOOM button that lets you choose the upper range of the portion of the water column that you want to zoom in on. You can adjust the actual size of the zoom window through the Main Menu. However, this feature lets you track the display on a specific depth within the water column. Not only that, it can also be a bigger benefit in a variety of fishing situations. The device features The Interference Rejection system so that it can conquer competing return signals from other sonar units. So, when other devices cause you can activate the IR feature via hitting the IR button that you will find on the control panel. The lx9 comes with 12 levels of interference rejection. You can get the correct level of IR only when the display is clear of display mess. This device comes with an 8 inch LCD flat panel with four color palettes to experiment with. And this is another reason to have this marcum lx9 review. However, the Dashboard Display keeps the angler updated with the most acute information. Starting from the digital depth, it will show the battery voltage, interference rejection (IR), range, gain, target adjust, or any combination thereof. So, you can experiment with different dashboard arrangements and settings in simulator mode. Thus, all the controls and information are just dependent on your fingertips. It features a camera that lets you see what’s going down there. You can record the underwater activity and upload them anywhere. Display images are clear and sharp. Zoom feature anywhere in the water column. It features temperature sensor, electronic compass sensor and a pressure sensor. It has the capacity to detect and overpower other sonar units via Interference Rejection system. It features an 8 inch LCD flat panel with four color palettes. Switchable dual beam transducer so you can switch between the beams. The peak to peak power of this Marcum unit is 4800 watts. You might get a torn bag. Some have complained regarding the camera glass being not clear and does not show a clear image on the screen. You might find the 12V battery upside down hence the negative terminal on the battery might get bent. It does not come with a wide life expectancy of battery so it might run out quickly. 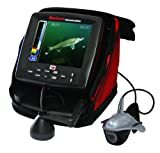 Q: Can you attach the Marcum LX-9 Digital Sonar to the computer to scan underwater? A: The only way that you can attach the device to the computer is if you have an adapter to go from TV hook up to USB, but then that only goes for the video part. Q: Does it include both camera planner and plastic snow shield? A: Yes, it includes both camera planner and plastic snow shield. Q: Does this model have GPS of the lakes? A: No, it does not have a built-in GPS. Q: What is the run time of the device? A: the brand says it can run about 8 hours. Q: Does the device have a temperature sensor and zoom option? A: Yes, the device has both the temperature sensor and zoom options. However, using the LX-9 can isolate significant details on the targets and consequently define a few patterns so that you can ice fish more efficiently. Not only that, the device has also the capacity to record everything that it sees underwater so you can upload the experience to share it with your friends. We hope you have got all of your questions with this marcum lx9 review.